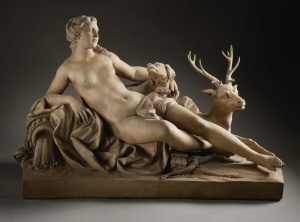 Actaeon was a mighty hunter – he would roam the forests of Western Greece in pursuit of boar or bear, would trap rabbit for flesh and fur, but most of all he loved to chase deer with his faithful hounds. One day whilst in the deep wilderness, his hounds came upon a scent, and so intent were the hunter and his pack on the chase, they followed it into groves which were forbidden to mortals. The hunter stumbled after them until he found himself in a small clearing and stood agape at the naked beauty before him. Artemis was there, bathing in a shallow pool. “No man may see me bathe and live to boast of it!” Seizing an olive branch as a wand she waved in the direction of Actaeon. He found himself bending forwards, his hands and feet began turning to hooves, and from his crown burst forth a pair of magnificent antlers. The predator had become the prey. Artemis whistled, and Actaeon recognised his own summons to his hounds. He heard them calling to one another, and he ran for his life. The pack could see nothing but another fine stag to bring down. Faster he ran, but the hounds were swifter still. As they had many times before, they cornered their prey and pinned it down as they awaited their master. Eventually they tired of waiting for their master’s permission, and began to tear into the flesh of the whimpering stag. Artemis is a suitable deity-model for druids and rangers. She can appear alongside her fellow Olympians, but is more likely to be found in a remote wilderness temple or a hermitage. All the Greek pantheon accepted sacrifice of precious materials, so even the wildest of temples could feature gold, gems, and especially ivory.